Anyone who is considering becoming or is currently a companion animal owner should be aware of the potential risk of zoonoses, which are infectious diseases that can be transmitted from non-human animals to humans (or the reverse, in some cases!). We are fortunate not to have too much firsthand experience with zoonoses here at the Center for Avian and Exotic Medicine, but there are several diseases we feel are worth mentioning as they can occur in species that we care for. The first on our list probably sounds familiar to many bird owners: psittacosis. The root of the name tells us that it is a disease carried by species in the family Psittacidae, the true parrots. Accordingly, psittacosis is sometimes called “parrot disease” or “parrot fever” in people. This is somewhat of a misnomer, however, as humans may contract it from many other species of birds. When the infection occurs in birds, it is known as avian chlamydiosis, hinting at the fact that both the human and bird forms of the disease are caused by the bacterium Chlamydophila psittaci. Symptoms in birds include difficulty breathing, inflammation of the eyes, green urates (the part of the droppings that are normally white), and watery stool. Left untreated, psittacosis can be lethal to birds in a matter of weeks. Bacteria can be present in the feces and nasal discharge of infected birds, which would be the most likely avenue of infection in a companion animal owner. In humans, the disease appears as an atypical pneumonia potentially accompanied by fever, severe headaches, nosebleeds, and diarrhea. Fatal human cases are rare and once diagnosed it is treatable, but psittacosis is clearly something to be avoided! Preventing this disease is easy with annual check-ups for pet birds at which time we can test for psittacosis ,when indicated, and help with early detection. The next zoonosis on our list might be on the minds of reptile enthusiasts: salmonellosis. Like psittacosis, this disease is a bacterial infection, this time caused by members of the genus Salmonella. Also like psittacosis, it can be found in (and contracted through contact with) the excrement of animals carrying the disease. Though primarily associated with companion reptiles, especially aquatic ones, it can also be found in many other animals, such as cats, dogs, birds, and livestock. 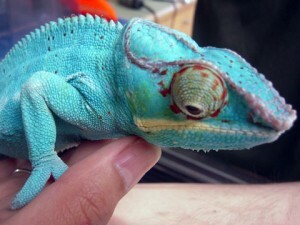 Salmonellosis can be difficult to detect in pet reptiles as it often does not cause any signs of illness, and Salmonella is part of their normal bacterial flora. Symptoms in humans include stomach pain, fever, and diarrhea. The majority of cases in humans are actually the result of consuming contaminated food, but proper husbandry and hygiene should certainly be a consideration in order to prevent transmission from pets to people! Our recommendations are to always wash hands after handling pet reptiles, to avoid getting aquatic reptile water splashed in eyes or mouths, and to not let children handle them without constant supervision by an adult. Next, we have dermatophytosis, commonly called ringworm, which is mainly a concern for mammal owners. Ringworm is another misnomer as the disease is actually caused by several different fungi; no parasitic worms involved, thankfully. Infection in both animals and humans is characterized by itchy, circular rings on the skin which will continue to spread if left untreated. Transmission from pets is by direct contact with the afflicted area of shed hair that harbors the fungus. Dermatophytes are easy to test for in pets, and while treatment can be fussy involving baths and oral medications, it is well worth it to prevent this irritating rash on you and your family! Now we have something just for the ferret owners. Did you know that your ferret has the potential to give you the flu? And is similarly at risk of catching it from you? Ferrets are indeed vulnerable to influenza, and the disease manifests itself in much the same way as it would in a human: sneezing, discharge from the eyes and nose, loss of energy, and fever. As with humans, young, old, or immunocomprised ferrets are more vulnerable during the course of illness. If either you or your ferret have the flu, make sure to take the appropriate steps to avoid transmission: wash your hands frequently, minimize “snuggling” your ferret, cover your mouth when coughing or sneezing, etc. And remember, flu medications humans take when we don’t feel good are not safe for your pet ferret- so contact your veterinarian first! We felt the next two zoonoses were worth mentioning, as well, though they are generally only a concern for people with compromised immune systems. The first is cryptococcosis, a fungal infection commonly associated with acquired immune deficiency syndrome (AIDS) in people.Cryptococcis is most common in cats and dogs but can also be found in bird droppings, particularly from pigeons. Infection can lead to encephalitis and pneumonia in people. Finally, we have aspergillosis, which is an umbrella term for infections caused by fungi belonging to the genus Aspergillus. Aspergillosis is a much more common infection in birds, including pet parrots, than it is in humans. Aspergillus spores are ubiquitous and probably inhaled daily by most humans to no ill effect. The infection is, however, potentially very dangerous to immunocompromised individuals; in fact, it is a common cause of death in cases of people suffering from acute leukemia. This is, of course, by no means an exhaustive list of the zoonoses, but we thought it would serve as a nice introduction to a facet of medicine (both veterinary and human) of which any companion animal owner should be aware.